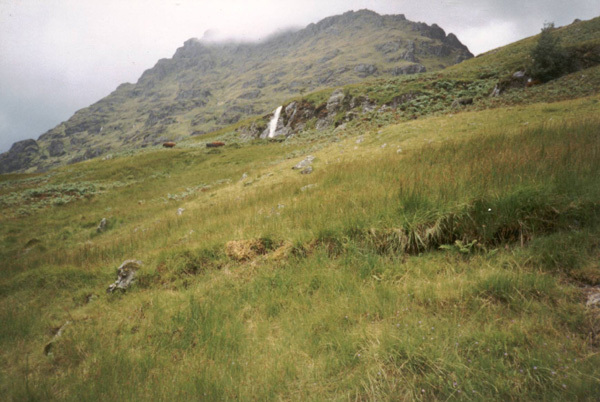 Follow Glen Loin into the heart of the Arrochar Alps. This low level circuit throws up impressive views of the surrounding mountain scenery and Loch Long. Just north of Arrochar a track to Stronafyne Farm strikes out from the A83 road just before it passes over the Loin Water. Head up the track, following the river upstream, to pass through the farmyard. Walk between the farmhouse on your right and a stone shed on the left and, just beyond, go through a gate leading to a track which takes you through a grassy field, alongside woodland, up the glen. After a short distance, go through another gate and the track rises gently along a tree-lined corridor to emerge into the open again. 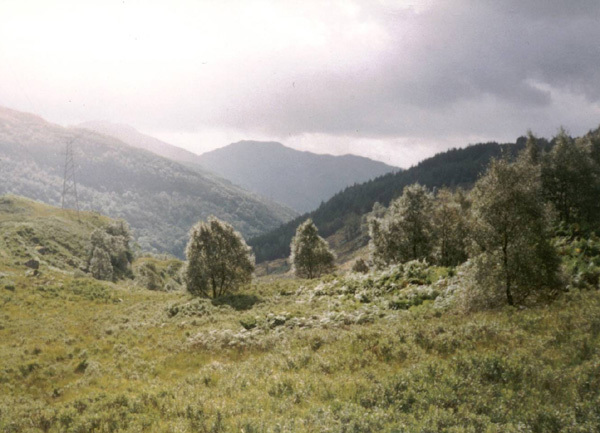 The way becomes less obvious and very boggy in places as it progresses up the glen. Follow the overhead pylon line north and climb to a gate and stile. From here the path degenerates further and is little more than a flattened line of grass through the low shrubs. Underfoot conditions can be wet and marshy here. A short but strenuous climb brings you up to the col and a pylon, sitting atop a small knoll. In the distance there is an electricity compound where the various lines of pylons converge above the hydro-electric power station at nearby Inveruglas, on the banks of Loch Lomond. The craggy hill ahead is Ben Vorlich and up to the left is A'Chrois and Beinn Narnain. Follow the path down under the pylons and as you near the compound, keep an eye out for a narrow break in the trees to your right. Follow this down and when you reach a gate at the edge of the forest, turn right. Descend by the fence to a bridge over the Inveruglas Water, just east of the croft at Coiregrogain. Across the water, a short track takes you up to a surfaced road. Turn left and walk up the road for about half a mile until you reach a bridge on your left. Cross this and head up the glen, towards Beinn Ime. As you make your way over the bridge, you will see the Loch Sloy dam up to the right. Follow the way through the glen until you reach a junction where the route splits into two, one section continuing up the valley and the other branching left and fording the river before turning sharp left and heading east through the forest. Take the latter. 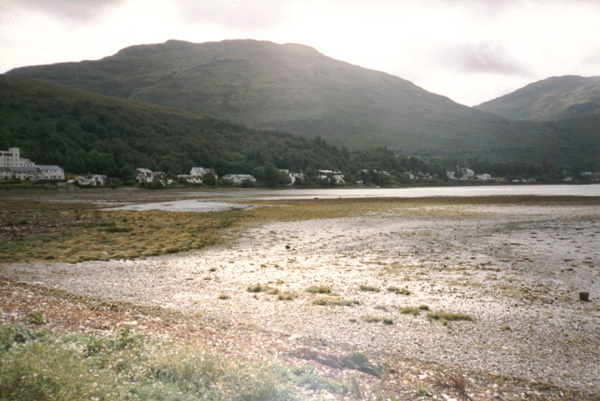 It contours round the lower slopes of A'Chrois and Loch Long eventually looms into view. Continue to the point where the track crosses the Allt Sugach by a concrete bridge. Just before the bridge, on the left, a steep narrow path descends through the trees. Take this to join the track again lower down. Go left, heading north, and follow it as it loops round into Succoth. At the first road junction you meet, turn left, then, a short way on at a telephone box, bear right down a tarmac path bringing you back to the A83. Map OS Landranger sheet 56, Harvey Arrochar Alps. Start Junction of access track to Stronafyne Farm and A83, just north of Arrochar. GR: NN 298050. Parking Large public car park at head of Loch Long, just outside Arrochar. Grading Track and path over open moorland and through forest. Route is indistinct in places and some sections can be wet and muddy underfoot. Some sheep grazing so dogs on lead.